Admission Price: This is event is now fully booked: returns may be available on the door, shortly before the performance. Explore Ensemble performs Morton Feldman's last completed work, Piano, Violin, Viola, Cello (1987), a beguiling tapestry of ambiguous harmonies, hushed timbres, repetitions and variations over a 70-minute span, in which time seems suspended. This concert concludes the two-day conference, Again & Again: Musical Repetition in Aesthetics, Analysis and Experience, which City, University of London is hosting 25-26 April 2019. Explore Ensemble voyages into the radical frontiers of new music, expanding the artistic horizons of audiences with outstanding performances of internationally acclaimed composers, advocating music rarely heard in the UK, and nurturing emerging composers and new repertoire for the future, working recently on music by Peter Ablinger, Joanna Bailie, John Croft, Michael Finnissy, Gérard Grisey, Luigi Nono, Enno Poppe, Fausto Romitelli, Kaija Saariaho, Sciarrino, Rebecca Saunders, and recently commissioning Patricia Alessandrini for HCMF 2017. Based around a core sextet and founded in 2012 at the Royal College of Music by composers Nicholas Moroz and Arne Gieshoff, Explore Ensemble has since become one of the UK’s most daring young groups, featuring at the Huddersfield Contemporary Music Festival in 2016 and 2017, Kammer Klang at Cafe OTO, Principal Sound Festival at St John's Smith Square in London, Handel & Hendrix in London, and at the JdP Music Building in Oxford. 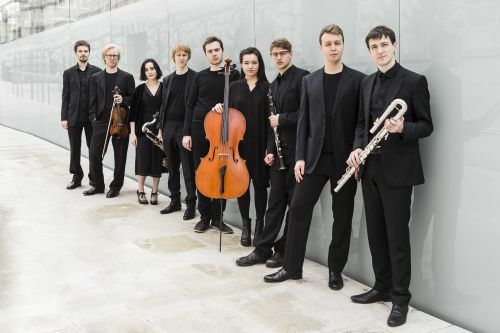 Recently Simon Cummings, writing on the 5:4 blog, described the ensemble's "Tracing the Moon" programme at HCMF as "one of the most beautiful things […] at HCMF this year, and further proof positive that Explore Ensemble are just as indefatigably outstanding as we all suspected last year." Explore Ensemble have also featured several times on BBC Radio 3's flagship new music programme Hear and Now. Their 2018-19 season sees debuts at Kings Place in London featuring Grisey’s Vortex Temporum and a new work by Lisa Illean as part of the "Time Unwrapped" series, and at the Zeitströme festival in Darmstadt, with music by Finnissy and Crumb.